David Warburton and some of the campaigners. 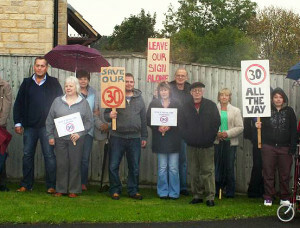 RESIDENTS are campaigning to extend the 30mph speed limit at the B3090 Oldford Hill in Frome for the entire distance of the road, from the junction with Gypsy Lane and Cuckoo Lane all the way to Oldford village. Somerset County Council’s current proposal is to impose the 30mph limit from the Gypsy Lane junction for 180 metres only, following which a 40mph limit will apply for the remaining 325 metres of road between Oldford Hill and Oldford village. The speed restriction at this point of the B3090 was previously 30mph. David Warburton, the Conservative prospective Member of Parliament for Somerton and Frome, has joined campaigners and said, “The B3090 Oldford Hill is a notoriously dangerous stretch of road, where speeding vehicles are common, and residents of Oldford have to take their lives into their hands when walking or driving out onto the main road. “It simply does not make sense to impose multiple speed limits along this road and increase the current speed limit to 40mph on the approach to Oldford village. The only way to make sure the residents of Oldford are kept safe from speeding vehicles is to impose a 30mph limit for the entire distance from the Gypsy Lane junction all the way through the village itself. The deadline for commenting on the scheme is Thursday 24th October 2013. Residents wishing to join David in registering their opposition to the proposal should put their objection in writing via www.somerset.gov.uk and search for Traffic Regulation Orders. To follow David’s campaigns for Somerton and Frome go to www.david warburton.org, or find him on Facebook and Twitter @DJWarburton.